Molecular illusions and deceptions. Ascending and Descending Penrose stairs. Scalemic molecules: a cheminformatics challenge! Hexavalent carbon revisited (and undecavalent boron thrown in). A little while ago, I speculated (blogs are good for that sort of thing) about hexavalent carbon, and noted how one often needs to make (retrospectively) obvious connections between two different areas of chemistry. That post has attracted a number of comments in the two years its been up, along the lines: what about carboranes? So here I have decided to explore that portal into boron chemistry. The starting point is the reported crystal structure of a molecule containing a CH12B11– anion (DOI: 10.1021/ja00201a073). This differs from the molecule I previously reported in having not so much 5C-C + 1C-H bonds around a single carbon, but instead 5B-C + 1C-H bonds. The basic cluster is much in fashion (as B12Cl122-) for its properties as a non-coordinating counterion. The CH12B11 (-) anion. AIM analysis. Click for 3D. Above is the QTAIM topological analysis of the electron density (B3LYP/6-311G(d,p) calculation) which reveals all 11 borons and the single carbon atom as being surrounded by six bond critical points. ELF tells us how many electrons populate the synaptic basins. The CH12B11 (-) anion ELF basins. Click for 3D. This clearly reveals that the bonding to the carbon and all the boron atoms is non-Lewis, i.e. that of the six bonds to each of the non-hydrogens, five are not of the Lewis two-electron pair type. The carbon for example is surrounded by five C-B basins, each of 1.02e, with its valence shell occupied by ~7.2e in total. The boron involved in each of the C-B bonds also has five bonds, with basins corresponding to 1.01, 2*0.95 and 2*0.73e. 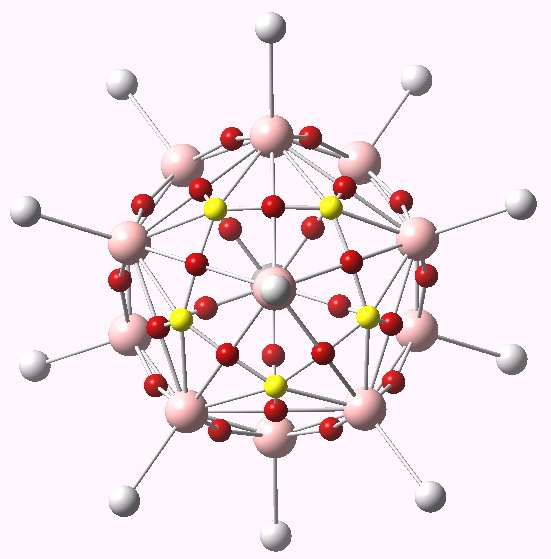 The boron directly opposite the carbon has five basins corresponding to five B-B two-centre bonds of 0.6e each, and a further five basins of 0.3e corresponding to 3-centre BBB bonds (shown as yellow spheres above). Arguably, that particular boron atom has eleven bonds to it! This molecule reveals quite clearly how sterile the debate is about whether carbon can be hypervalent. If the Lewis definition of a bond as an electron pair is removed, then hypervalency exceeding four can easily be obtained. What is certainly sacrosanct is the valence shell octet for carbon (and boron). Finally, I throw B12H122- in. 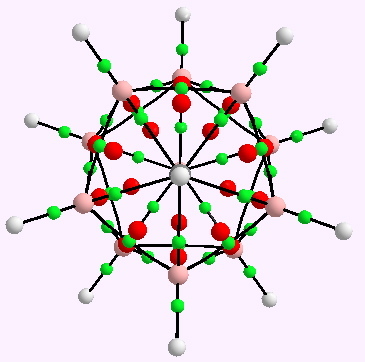 This has the wonderful icosahedral symmetry, and as you might expect, each boron is defined by five two-centre B-B bonds (~0.66e) and five three-centre BBB bonds (~0.24e), as well as a conventional two-electron B-H bond. Each boron is undecavalent! Not seen that particular valency before!! This entry was posted on Sunday, June 26th, 2011 at 6:30 pm and is filed under Hypervalency. You can follow any responses to this entry through the RSS 2.0 feed. You can leave a response, or trackback from your own site. My closing remark above was that I had not seen the term undecavalent used before. Indeed, it never seems to have been (in CAS). But I did come across many uses of the term decavalent. It seems that proteins can bind decavalently! Quite a departure from the normal meaning of the term. In ontological senses, one has to define one’s schema!